After two years in Chapman University’s MFA program and four semesters of writing workshops, conferences, and purposeful study of the craft of writing, I have debunked any notion that existed in my mind that writing is a peaceful, innocuous, inner journey of the soul. Naïve pre-enrollment images of my writer self stretched out on a blanket in the cool grass, the tip of a pen resting on my lip while I read the long, rambling passages I’ve just written and marvel at the poetic poignancy and gilding of my own prose and the ease with which it was conjured and articulated are recalled now for mere hilarity. Writing is a violent, scything, and arduous enterprise of the psyche, like the deepest, darkest session on a therapist’s couch. Writing, I have discovered, is all about fighting your demons and killing your darlings. I’ll never forget the first time (or the eighth time) a writing instructor advised me to kill my darlings. We had just workshopped a chapter of my novel, one with which I was particularly pleased and which, I can admit in retrospect, was chockfull of “darlings” – words and images of adornment that I believed were critical to the work’s merit. Kill my darlings? My professor may as well have asked me to feed my childhood stuffed bunny into a woodchipper. Back home at my desk that night, I began the relentless slayings, highlighting and deleting adjectives, adverbs, and darling after darling until there was nothing left of any real interest. And then it hit me. Oh. I see. There’s nothing here of any real interest. That moment of revelation is when the demons pounce. 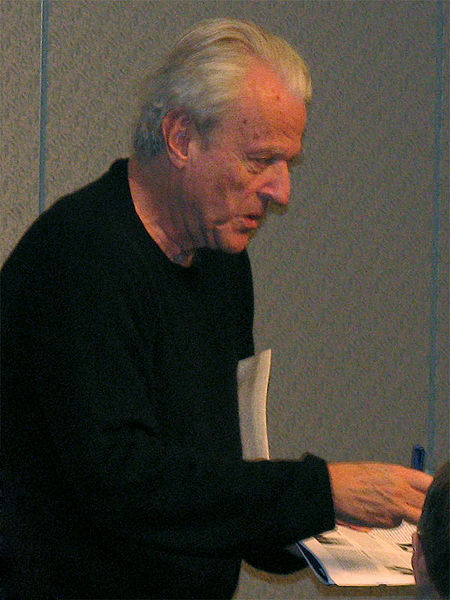 Novelist, playwright, and screenwriter William Goldman, who was born on this day in 1931, elucidates this moment perfectly: “Writing is finally about one thing: going into a room alone and doing it. Putting words on paper that have never been there in quite that way before. And although you are physically by yourself, the haunting Demon never leaves you, that Demon being the knowledge of your own terrible limitations, your hopeless inadequacy, the impossibility of ever getting it right. No matter how diamond-bright your ideas are dancing in your brain, on paper they are earthbound. If you’re trying a screenplay, you know it’s never going to be Bergman. If it’s a novel, well, what kind of a novelist can you hope to be when Dostoevski was there before you. And Dickens and Cervantes and all the other masters that led you to the prison of your desk” (Adventures in the Screen Trade: A Personal View of Hollywood and Screenwriting, 1983). On second look and remembering your instructions I did find “Best of Archetype” And I have spent an hour reading. I selected by titles that appealed to my – I like the dramatic. So “Pathetic Fallacy” “Demons & Darlings” “A Silent Abyss”. I find they are all commentary. I do read commentary every day. Mostly Op Ed. But my taste here is to literature. What I’d like of you is that which is vulnerably you – poems and stories. Can you direct me, perhaps select titles. PS – After you have read “Summertime”- the first of the New Orleans posts chronologically – tell me if I owe you that glass of champagne. I doubt it. Only a 1,000 words but an emotional 1,000 words. Thank you for spending so much time perusing Archetype! I do post mostly commentary; however, excerpts from some of my fiction and nonfiction essays are published at the top and in “Original Work” to the right. I publicize only short excerpts for obvious reasons but am happy to send you full versions or longer excerpts of anything you like. My only poem on the site is “Peter Pan and Princes,” which I wrote in my early twenties. I am still getting caught up from being in class all week but look forward to reading your pieces this weekend. I’ll definitely let you know if champagne is owed! Thanks again, and I’ll be contacting you soon!